A new Sonata in test driving at the Hyundai plant in Montgomery, Ala. The South Korean company, once the object of jokes on quality on Opra Winfry Show, is gaining huge popularity. Toyota Motor Corp. may scare Detroit's automakers, but there's one rival out there that worries Toyota. It's South Korea's Hyundai Motor Co. Already the fastest-growing major automaker, Hyundai says it wants to supplant Toyota as the industry's vehicle quality leader in three years. Such a goal sounds gutsy, coming from a carmaker that was a running gag on late-night TV not so long ago. But U.S. and Japanese auto executives take Hyundai seriously now. "We're always looking in our rear-view mirror, and they're one that's coming up quickly," said Dennis Cuneo, senior vice president of Erlanger-based Toyota Motor North America Inc. In just a few years, Hyundai has emerged as a pacesetter, after achieving huge strides in sales and quality in about half the time it took Japan's leading carmakers. The family-run automaker, which also controls Kia Motors, has leapt from 16th in the global sales rankings in 1998 to seventh last year, just behind DaimlerChrysler AG. In the United States, the Hyundai-Kia Automotive Group is clawing sales from the Big Three after winning customers with stylish vehicles, low prices and quality assurances backed by a 10-year powertrain warranty. "They (Hyundai) are very aggressive in the marketplace in terms of their investment and pricing," said Paul Ballew, General Motors Corp.'s head of global market and industry analysis. Benefiting from lower production costs, Hyundai and Kia are hammering rivals in the "cheap and cheerful" small-car segments in North America and Europe. The Seoul-based automaker also is expanding rapidly in the world's two most populous countries, China and India. 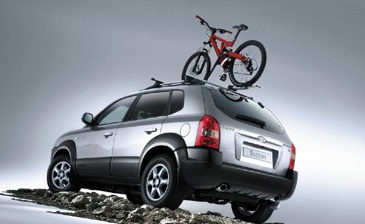 "We're tremendously confident about our future," Kim Jae Il, Hyundai senior executive vice president, said at the 2005 Seoul motor show. John Krafcik, vice president for product development at Hyundai Motor America, says the company combines some of the finest Japanese qualities, such as discipline and focus on eliminating waste, with a can-do spirit he traces to Hyundai's origins in car repair. "There's a 'lift yourself up by your bootstraps' culture that runs through the whole company," said Krafcik, former chief truck chassis engineer at Ford Motor Co. In March, Hyundai began operating its first U.S. plant, a $1.1 billion factory in Montgomery, Ala. It will turn out the new Sonata. The car represents a big leap for Hyundai, boasting more standard safety equipment than any model in its class, including the Chevy Malibu or Honda Accord. 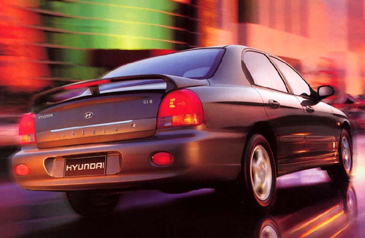 Company executives still recall Hyundai's dismal record in the United States during the early 1990s, when the Excel compact flopped in the market. However, the company's dogged effort to improve quality paid off. Last year, the Korean automaker jolted rivals when the Hyundai nameplate beat the Toyota brand in J.D. Power and Associates' U.S. initial quality rankings. Overall, Toyota scored higher than Hyundai in the survey of new car owners because of the Lexus brand's sterling rating. Toyota's long-term reliability scores also are better than Hyundai's. 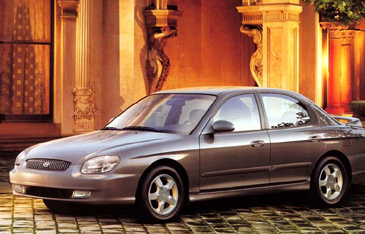 But the influential Consumer Reports magazine rated the Sonata the most reliable car in 2004. 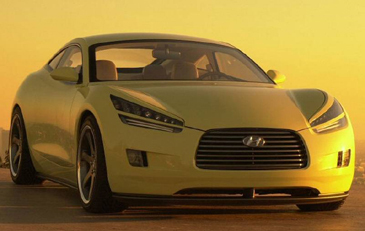 As Hyundai improves quality and adds models, rivals find themselves under mounting pressure from the Korean carmaker. "Our goal of being No. 5 in worldwide sales has been supplanted by the goal to be No. 1 in quality," Lee Hyun Soon, senior executive vice president in charge of powertrain, said at the show. "We're obsessed with quality now." The company is repositioning the Hyundai nameplate above Kia, to distinguish the brands.